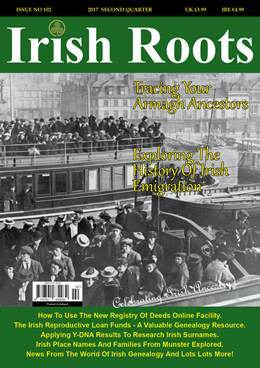 The June edition of Irish Roots Magazine arrived in my postbox yesterday morning, and it's another excellent issue with a wide range of features covering traditional family history, genetic/DNA research, Irish history and heritage, news of record releases and other developments in Irish genealogy, and much more. Regular readers of this blog will know that FamilySearch.org recently began digitising microfilmed material from the Registry of Deeds – one of the last largely untapped major Irish archives for genealogists. As this vast collection of material starts to become more accessible and ready to give up its secrets, many researchers will be wanting to become familiar with the archive and the online facility. Cue a timely feature to explain the records and find your way around the database. Another resource under the spotlight is the Irish Reproductive Loan Fund collection. This, too, is timely, as the surviving records (almost all from western seaboard counties) are available on FindMyPast and, from next month, on Ancestry. This feature examines the funds from a historical perspective and analyses the surviving material for evidence of how our ancestors felt about money, debt and poverty. It's quite an eye-opener. There's also an in-depth listing of the many resources available to those with ancestral connections to the Orchard County – Armagh – and a guide explaining how the results of Y-DNA tests can be applied to surname studies. Talking of surnames, there's also the second of a four-part series looking at Gaelic place names and families from each of Ireland's provinces; this issue is the turn of Munster. The Irish emigration in the 19th century is the focus of another article; it looks at the events and social conditions that played a part in the exodus, especially to North America, the journey endured by the emigrants and the discrimination and hardship they encountered on arrival in their new home. Sticking with the 'leaving Ireland' theme is a feature exploring the comprehensive records known as the Irish Gift presented to mark Australia's Bicentenary nearly 30 years ago: the Australia Transportation Records, which not only include details of those transported, but also applications from the convicts for their families to join them in their new land. As always, Irish Roots Magazine is full of news. Apart from my own What's New? Review, which sets out the quarter's most important record releases, there's news from family and local history societies, comment and observations of other recent events, letters to the editor, a reader's story of successful research, and a helpful Q&A column. This issue also brings details of a project to connect descendants of the Mountbellow Orphan Girls who sailed for Australia in 1853. The project plans a commemoration of the Girls next year, and TV documentary is scheduled. Irish Roots magazine is available in both print and digital format, as a one-issue purchase or as part of a subscription package. See full purchase details (and don't miss the free sample of the issue).